We are excited to announce our next Faces of Tahoe City feature! Clint Peetz is the Owner of Fat Cat Bar & Grill located in Downtown Tahoe City. In addition to Clint’s dedication to providing the region with fresh, local, sustainably grown food, he also serves as a Board Member for the Tahoe City Downtown Association. 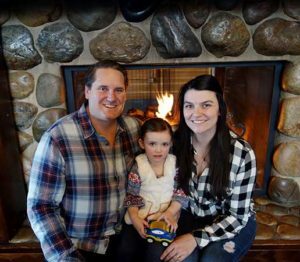 Clint Peetz and his family have been in the Lake Tahoe area for generations and his dedication and passion for this area truly help make Tahoe City a better place. Clint was born in Truckee before moving to Newport Beach as a child. He spent his childhood in Newport Beach and remembers the “beach town” vibe it used to have before commercializing in the 90’s and early 2000’s. Clint’s early years exposed him to the restaurant industry, but he found his calling in restaurants after working at the Chart House in Newport Beach. Clint would spend 3 hours every day setting up and closing the salad bar at Chart House. Even though this was one of the lowest positions on the culinary team, he remembered his Grandpa’s words of wisdom, “Pick one thing and be the best”. Clint dedicated himself to the Chart House and over his career her moved from the Salad Maker to Server where he truly fell in love with the industry. After finding his passion, Clint went back to school to finish his education in Culinary Arts and Business Management. He knew that one day he wanted to own a restaurant and dedicated himself to acquiring the skills necessary to succeed in the role. During his time in Newport Beach, Clint always found opportunities to travel back up to Lake Tahoe to visit friends and family. Clint soon felt the pull of Lake Tahoe in his heart. He moved back to the basin after culinary school and continued to build his resume and reputation in high-end dining while working at some of the best restaurants in Lake Tahoe. Clint then took a position at the Hyatt Lake Tahoe to further his experience in management. Demand for Clint’s skills was high and after careful consideration, Clint moved back to San Diego to take a position as General Manager of The Red Marlin Restaurant at the Hyatt. It was here where Clint got engaged to his future wife. Like most people, Clint just couldn’t ignore the passion and love he had for Lake Tahoe and after 2 years, made the decision to move back up to the Basin. This time for good. In 2014, Clint and his Wife welcomed their daughter Chloe. It was at this point Clint made it his mission to own his own business. He wanted to have the freedom to spend time with his family. Clint found Fat Cat Bar & Grill and the rest is history. He recognized the potential in the property (Formerly Fat Cat Café) and knew that his vision would match perfectly with the potential of the space. Clint and his team renovated the property, secured a liquor license, developed a new menu and completely changed the fabric of the Downtown corridor. Fat Cat Bar & Grill is now known as THE place for fresh, local food. Fat Cat Br & Grill is dedicated to sourcing from local farmers and producers in order to provide the best quality ingredients for their guests. In addition to the food, Clint wants to make Fat Cat Bar & Grill a place where people can come and enjoy themselves. They offer trivia nights, live music, karaoke, sporting events and fundraisers! Clint truly wants to support the community that supports him. Clint recently joined the Tahoe City Downtown Association Board of Directors in January 2018. He wants Tahoe City to stay a “Mom & Pop” town that celebrates local business and community. Clint & Fat Cat Bar & Grill are dedicated to bringing vibrancy and excitement to Tahoe City for generations to come. For more information on Fat Cat Bar & Grill visit their Fat Cat Website or find them on Facebook – Fat Cat.